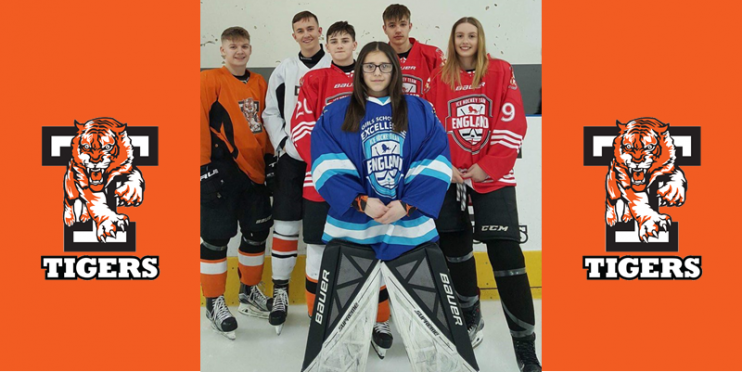 Five ice hockey players from Telford’s junior development programme are jetting off to Slovakia on Easter Monday to play for England. The young athletes will compete in a series of international challenge games in Bratislava, alongside a five-day national team training camp. Seventeen-year-olds Brodie Jesson and Will Reed, from Telford U18s, have both been selected to play for England U19s. Tigers U15 Sam Watkins (14) has been named as the England U15 captain, playing alongside his Telford team mate Alex Blake (15), while Grace Garbett (14) lines up for the England U17 Women. Telford Junior Ice Hockey Club head coach Tom Watkins said: “As an athlete, it is always the ultimate honour to be allowed to represent your country, and we are thrilled to have five players selected for their national squads. “I have coached most of these kids since they took their first steps on the ice, so I am incredibly proud of the commitment and effort each has shown to reach this achievement. All of them have demonstrated enormous dedication to their training and fitness, so they fully deserve their international opportunities. The England teams travel to Bratislava on Monday for the five-day camp, staying at a purpose-built athletes’ village where they will prepare to face teams from Austria, Romania, Slovakia and the Czech Republic. TJIHC runs teams from U9s to U18s, offering ice hockey to boys and girls from as young as five. Telford Tigers operates Learn to Play courses with equipment provided, enabling beginners to try out the sport and develop the skills needed to join their age group team.